Method 1 (which I used): Combine all spice blend ingredients including butter. Use this to rub entire chicken with before roasting. Try to separate the skin on the breast and rub some of it between the skin and the breast meat for extra flavor. 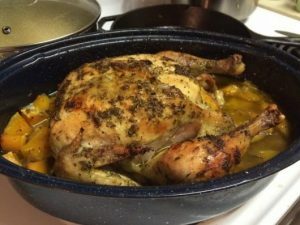 Stuff the chicken with the halved lemons you zested and squeezed over everything, as well as a few smashed garlic cloves and onion slices, more salt and pepper, and a few sprigs of leftover rosemary if you have any. Method 2 (called for in the book): Brush the chicken with melted butter, then sprinkle on the spice blend. Stuff chicken with cut up lemons, onion, and garlic. Instead of placing the chicken on top of sliced carrots and chunks of onion I used cubed butternut squash and sliced onion this time, which I tossed with minced garlic, salt, pepper, and olive oil. Roasted butternut squash is divine, and it pairs perfectly with rosemary (plus I was out of carrots). I had the lid on part way through the roasting time, which resulted in a lot of pan juices! Next time I will leave the lid off the entire time, especially if I use butternut squash. I served this with cauliflower “rice” since the Practical Paleo cookbook put me in more of a Paleo mood.